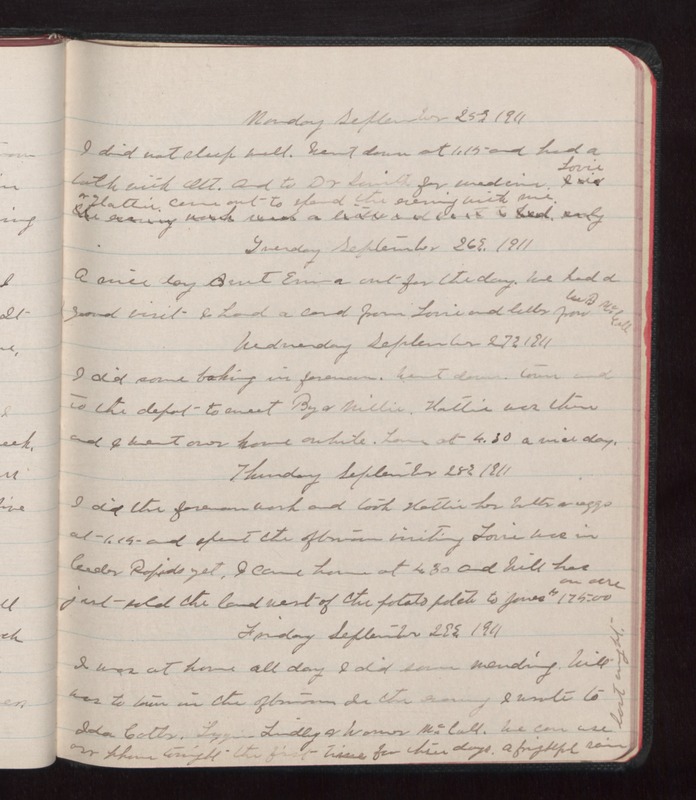 Monday September 25 1911 I did not sleep well. Went down at 1.15 and had a talk with Ott. And to Dr Smith for medicine. [Lorie?] & Hattie came out to spend the evening with me. Tuesday September 26 1911 A nice day Aunt Emma out for the day. We had a good visit. I had a card from [Lorie?] and letter from [illegible] B [McColl.?] Wednesday September 27 1911 I did some baking in forenoon. Went down town and to the depot to meet By & Millie. Hattie was there and I went over home awhile. Home at 4.30 A nice day. Thursday September 28 1911 I did the forenoon work and took Hattie her butter & eggs at 1.15 and spent the afternoon visiting [Lorie?] was in Cedar Rapids yet. I came home at 4.30 and Will has just sold the land west of the potato patch to Jones $175.00 an acre. Friday September 29 1911 I was at home all day I did some mending. Will was to town in the afternoon In the evening I wrote to Ida [Colter?]. Lizzie Lindley & [Warner?] McColl?]. We can use our phone tonight. The first time for three days. A frightful rain last night.